25A, Water Heater Timer, Electric, External Switch, On/Off Indicator Light, Single Pole, Single Throw, 6,250W, 250V. Capacity: 25 amps (6250), 250 volts, 60 Hz. 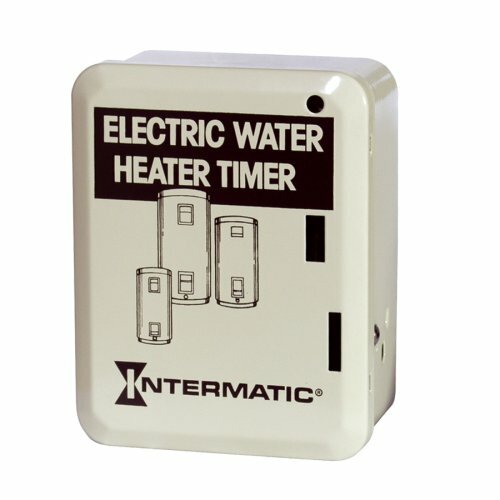 I purchased this for a 55 gallon water heater with two 4500w elements. so I could use this SPST device with a 6250W rating. I purchased about 6' of extra 3 conductor wire (10 gauge) and screwed this to the wall. Made all the connections, set it. it works. 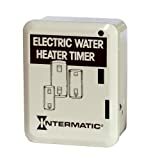 Most studies I could find say this does not save you much money but in our situation where our water heater is in the cold garage and we are only two people who use limited water our standby losses are therefore significant and so I think it should save us a few dollars a month perhaps. The water is set at only 115F and is still plenty hot 2-3 hours after the timer turns off (even if one of us has taken a shower). This product is easy to install if you know what you are doing. You should have some background in electrical ampacity and wiring basics. The heater had the wiring flex tubing direct from the wall to the top of the heater. The additional material was about 10.75 at the local hardware store. I unhooked the wiring from the heater and wired it to the timer, then wired the new pigtail to where I had disconnected the original wires. The timer has knockouts on the bottom for either 1/2 or 3/4 inch connectors so if it will accomodate either one. You most likely will have 1/2" connections. Make sure you turn off the breaker before you start. The entire process took about an hour total. The instructions that come with the timer aren't that great, so if you don't know what you are doing, it won't help much. The timer comes with 3 sets of on/off clips so you can time it on and off 3 times. We set it at on at 5 am, off at 8 am, then on at 8 pm off at 10 pm. So the timer is on 5 hours a day and off 19. We figgure we will save around 25 dollars a month off the electric bill. So... it will take at least 2 months to pay for the timer and other materials we bought. If you pay someone to install it, it will take much longer to pay for itself. plenty of hot water and it only runs a few hours a day. but had to replaced heater elements twice so far, to bad Intermatic did away with this model, maybe it lasted in the field too long for them.